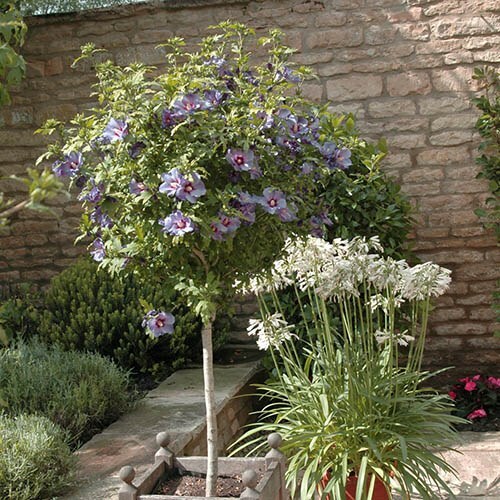 Create a fabulous exotic look to your garden or patio, with our glorious hardy Hibiscus 'Marina Blue' standard lollipop from tree - years of fabulous late Summer floral displays from this ever so easy to grow tree. Despite looking very exotic, with the huge blue flowers, they are very tough and hardy indeed. You can therefore plant this in the garden with confidence, for stunning displays for many years to come. Grow it in a warm, sunny spot for the longest lasting and biggest displays - they can be hungry feeders, so give them plenty of feed as they come back into leaf and set buds. Supplied as a triple top-grafted standard tree, grown on in 3L pot, approx 90cm - 1.2m tall, ready to plant straight out. Dormant in Winter, so no leaves on Oct - April. To ensure plenty of flowers, Hibiscus appreciates being planted in a sunny position, sheltered from strong winds. Happy in a large container as long as you keep it well-watered. Protect the crown with a dry mulch through the winter months. Trim any dead or damaged growth each year in mid spring and remove faded flowers. Hibiscus flower on the current season's growth, so pruning encourages them to flower prolifically.